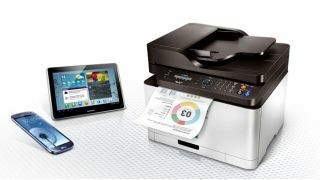 Samsung has launched its latest NFC-enabled printer range aimed at the 'small and midsized' (SMB) market. The new printers, which were unveiled at the Samsung European Forum, include the mono laser Xpress M2880 Series, capable of printing 28 pages per minute, and the colour laser Xpress C1860 Series, capable of printing 18 pages per minute. Both series come with NFC and Wi-Fi Direct, allowing businesses to go wireless with their printing needs. NFC functionality means that users can tap their smartphone on the printer to send files for printing. For those wanting to use Wi-Fi, users can print directly from any Samsung Galaxy device with the default print button. For other devices, there is Samsung's mobile printing app, available in the Google Play Store and Apple App Store. The Xpress Series also supports Google Cloud Print. In addition to the new printer range, Samsung revealed server-free printing software called Business Core Printing Solutions. The software comes installed on Samsung printers, and since no server is required, it can reduce IT costs. Samsung also introduced a new web-based XOA open platform tool, designed to tackle the obstacles of the XOA Embedded solution, which launched in 2010, but was limited to high-end printer and copier products. The new web-based platform can be used on low-end devices, catering to smaller businesses. The aim of XOA is to provide a slew of custom printer solutions for the enterprise sector, including enhanced printer security, a Managed Printer Service, document distribution, and remote device monitoring. A slew of third-party solutions are also available.